It has been, more or less, 3 months since I had my last teaching session in China. After being off work during this summer vacation, only traveling and exploring the South-East Asian countries, I started to miss teaching a lot. Once we got to Siem Reap and found a house,I was ready to look for a teaching job in a primary school. I updated my CV and cycled around the city dropping my resumes in random schools, in my free time. After a few days, I got a job :-). These are my little students I teach. Always happy and smiley. I am working in Florida International School from Monday to Friday having two classes per day. These are the best working hours for me as they fit my schedule perfectly. I get up at 6am to get ready for my class and I’m back home at 10.30 am, having all day to work on web design. My schedule is always the same- I start my morning class at 8.00 till 9.00, then have a 10-minute break to have another class at 9.10-10.10. The morning classes wake me up and I don’t need a coffee any more! :). The only one thing killing me is the length of the classes- 60 minutes instead of the usual 45 minutes, but I am getting used to it (I mean my throat is). I teach two groups of students, all at basic level. Both groups are lovely and willing to work with me, so that’s the most important thing. Both groups are also happy, positive and so adorable. Kids are active and their English is super good. They can speak English pretty fluently, talking to me all the time. They are not shy and keep laughing. Students are 7-10 years old but some of them look older. I have noticed that teachers in Siem Reap focus more, unlike n China, on listening than speaking. Students must, above all, listen to the teacher talk and they repeat after him/ her. It is something new and great as in China I was told “Kids must speak. They must open their mouth. Make them speak. Do what you can to develop their oral language” and so on. Here, it’s different. I start my class with singing some songs to warm my students up. We usually sing two songs clapping our hands, jumping and stamping our feet. Then it’s time to revise what we did on the previous class, we learn new vocabulary afterwards, drill in pronunciation, play games and describe pictures a lot. Students never seem to get bored and the teachers are pleased with my teaching methods. I get a feedback after my class so I know what I need to change, improve or eliminate from my plan. I find the feedback very helpful and motivating. I don’t print flashcards anymore due to the limited school budget. I have never been told to stop doing it or reduce printing but I can see that none of the teachers do it, so there must be a reason for it. I draw everything on the blackboard instead or ask students to bring some photos of clothes (if we do clothing lesson). As long as I have my students in the classroom, a piece of chalk and a small blackboard I’m fine. This is more than enough to start the class. Before having my first class in Siem Reap, I was imagining myself being in a tiny wooden room with no chalk, no blackboard and my students sitting in a group. Surprisingly, it didn’t happen. My school is lovely. There are 3 floors, many colorful classrooms, nice chairs and desk for the teacher. There is also either a fan or air conditioning in every classroom. I can’t really complain. I have more than enough to teach these kids some good English. There is a CD recorder and a small library in the school with plenty of read and picture books in case I need additional sources to get some ideas for my classes. So far, I have met only the headteacher, the secretary and my two co-workers. The headteacher is a very friendly and nice man. It looks like he looks after foreign teachers a lot and there is a genuine atmosphere in the school. The teachers look very hard but they never stop smiling, which is nice. I hope to get to know more staff members later. In Cambodia teaching English is much more effective. Most of students can speak English at the age of 6-8, which in China is almost impossible or very rare. Kids in Cambodia, unlike in China, are not afraid of speaking. They are not only unafraid of oral English, but also so willing to speak and happy to have a conversation with me. In China, I had to buy a bag of sweets for my students to convince them to speak. Chinese kids are way too shy. In my class in Siem Reap there are only 15-23 students. In comparison to 70-90 students in China, it is much better for my throat and the effectiveness of teaching. I don’t use a speaker anymore, don’t need to shout like crazy and it is super easy to manage the discipline. There is always one teacher in the classroom with me in case the students don’t understand something or behave inappropriately. I don’t need it, but I feel more relaxed and chilled out when someone is around. Nevertheless, nothing is going to beat China when it comes to the pay. I got paid 5 times more per class in China than in Siem Reap. The Cambodian salaries are very low for everyone no matter if you are Cambodian or European. Foreigners still get paid more than locals but it is still not enough to live here. For me, doing teaching in Siem Reap is more like having fun, getting more experience and developing myself further than earning any money. I would probably spend more on tuk tuk than earn in the school if I didn’t have a bike. In China, the school and the government cares a lot about the teacher. You get your working visa, accommodation and food for free. In Cambodia nobody seems to care about it. I have just started my teaching experience in Cambodia and I hope there is still a lot for me to learn about the education system, my co-workers, students and the school. So far, I am doing what I like to do and have a lot of fun :-). Soooooooo envious…..!!!! We want to hear all the details tomorrow! Let’s find a place to meet up. We will probably be staying close to Kaosan Road (not on it, definately! ), so if your hotel is around there, too, it should be easy to meet. Let’s communicate some more via email :) Looking forward to seeing you guys! Aaaah, we absolutely love the pictures of the kids…. So glad that you can put all your fantastic experience to good use in yet another country! Can’t believe that 7-10 year olds English is so good! What conversations do you have with them? Last time we talked about similarities and differences between Cambodian and European weather and clothes style. Their English is so good you wouldn’t believe! I’m such a nerd for reading articles by other teachers, and I really loved this. It was super interesting reading your comparison of China vs. Cambodia – I feel like I know more about teaching in China know. I totally find that my Cambodian students are so much more willing to speak, or even excited to speak, compared with my sometimes quiet students in Korea. Glad to hear that you seem to be liking teaching in Cambodia as much as I do! Hey! Thanks a lot for your comment. Yes, I am really enjoying teaching in Cambodia. Maybe we can meet up one day and speak about it. Have fun with your students! Would love to meet up sometime. Please do drop me a line when you head to Phnom Penh next, and I’ll get in touch when I’m off to Siem Reap in the future! Cheers! We are going to keep you posted. Enjoy your time in Phnom Penh. Hey! I quit the job, unfortunately the working hours were too long and I was not paid much at all. I spent too much time preparing my classes and I was not paid properly. I am getting back to blogging now, but had an amazing time as a teacher in Cambodia. I am thinking of coming back to China maybe next year. They do have fun with me indeed. They love to play with me, it’s such a great time! Loved this post. I’ve been teaching in Japan for about 20 years but I’ve never really seen beyond that. I have thought about making a jump over to Vietnam or Thailand for a few years when I’m about to semi-retire and just do it for the experience and to get me out of bed in the morning — but this post has now put Cambodia on my radar as well. As you also have experienced, the difference in having students who almost never open their mouth to students who just love to talk makes all the difference in the world. Thanks Mike! That’s true. Teaching Cambodian kids is easier and different than Chinese students. However, they can be very naughty as well :). You should try to do some teaching in Cambodia too so you can see how it looks and works with Cambodian students, however the salary (even for native speakers) is extremely low in 90% of the Cambodian language schools. Most of foreign teachers quit after a month. My school in China said the same thing, but when you have over 60 high schoolers in a room built for 30 and only two of them actually care about learning English, “Make them speak!” is much easier said than done. Luckily, I realized pretty quickly that the other teachers, both Chinese and foreigners, were following a different teaching philosophy: “Make them watch movies and TV shows you’ve been wanting to watch yourself anyway!” It was very effective. Honestly… I can’t stop laughing! So true. You just nailed the point. If you feel like having a break from teaching just do it, do not hesitate! You might want to spend 6 months or even a year in China and teach English there. What do you think about it? You could travel, explore China and earn a decent salary. 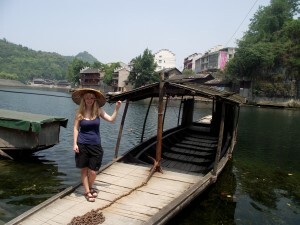 Me, Cez and Sarah (from http://thefurtheradventuresofbennett.com/ are currently working on a book on how to teach abroad focused on China. If you want, we can keep you posted and let you know when it will be fully completed and published so you might want to read it and feel like going to China to teach and have some adventures! Looks very rewarding, what an amazing opportunity! I know the feeling well – recently quit a permanent job to travel and write. But in Geneva, was at the UN when I came across a TV Reporter preparing for a live interview – gave me that pang of missing the job & adrenaline… but that’s a good thing when you see work as a profession not just a job – it always stays with you. I agree Anisha. As they say “Doing what you like is freedom and liking ehat you do is happiness” I love teaching and this is what really makes me happy. If you miss your job, maybe you can get back to work or work for yourself as a reporter while being on the road. Hi folks. I can whole heartedly recomend teaching ESL in China. Spent a year working at a private language school in Beijing. The school sorted out my visa, and everything else. China is a good country to teach in, very easy. Thanks. I love teaching, I hope I will get a job somewhere! thanks a lot for the tips and pics related to your experience “Cambodia vs China”. I am a teacher and I am considering moving to Asia after one year after I got my CELTA. Cambodia is on top of my list. However, due to the fact that I did not complete my BD and I am not native, I also think it is better to go and look for a job on the spot. So my question is: do you think 2.000 dollars are ok to start settling? This would mean flights and insurance already paid. Also, considering that school resources are limited, I feel a bit “scared” by my own teaching capabilities and the fact that I have little experience. The smiles of these kids are the factors which drive me the most. If I could afford it, I would just go and help them volunteering.